Binjai is the only condominium located on the 50-acre KLCC Park. KUALA LUMPUR: The Binjai On The Park development in Kuala Lumpur City Centre (KLCC) caused a stir in the property market when one of its two super penthouses was sold last month for RM38mil, making it among the most expensive homes to have been sold in Malaysia in recent years. Some property consultants, such as Zerin Properties chief executive officer Previndran Singhe, believe that this is the country’s largest condominium transaction, although it has yet to be verified. The buyer is a corporate figure who has been on Forbes magazine’s list of wealthiest people. On June 22, he bought the triplex penthouse, measuring 14,300 sq ft, on the 42nd floor of Binjai’s Tower B. The price tag of RM38mil meant the penthouse was sold for almost RM2,660 per sq ft (psf). “The buyer bought the penthouse to stay. He fell in love with the 360-degree unobstructed view of the KLCC skyline right at his doorstep, similar to views offered by the likes of London’s One Hyde Park. He said Binjai On The Park was just like one of his other homes around the globe,” said Terri Har, marketing and sales manager of Layar Intan Sdn Bhd, the developer. Layar Intan is 100% owned by KLCC (Holdings) Sdn Bhd, which in turn is a wholly-owned subsidiary of Petronas. Binjai’s two 45-storey towers have a total of 171 units. To date, the project has recorded sales of more than RM600mil at an average price of RM2,600 psf. Over the last six months, three other penthouses have been sold for approximately RM18mil. On a psf basis, the most expensive unit so far was a standard unit on the 38th floor, which was sold for RM2,900 psf or RM10.6mil. With Tower B now sold out, what is left are mainly Tower A’s standard units, which offer 3,700 sq ft each. 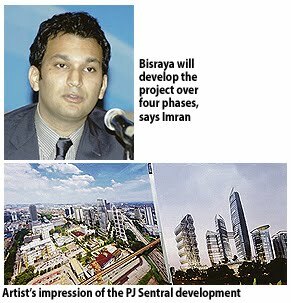 Binjai is the only condominium located on the 50-acre KLCC Park and is part of the KLCC development master plan. “Binjai’s key selling point is the fact that every unit has an unobstructed view of the park, along with a spacious balcony,” said HwangDBS Vickers Research analyst Yee Mee Hui. She added that most of the local purchasers bought Binjai units to live there or as homes for their children, while the foreign buyers treated the units as holiday homes or transit points. BUILDER and property developer Bisraya Construction Sdn Bhd will develop 4.8ha in Section 52, Petaling Jaya, Selangor, by the middle of next year as part of efforts to spruce up the city. The project, dubbed PJ Sentral and with RM2 billion gross development value, will involve upgrading and rehabilitating several buildings and facilities in addition to implementing traffic dispersal systems and new routes. "The project will be carried out over four phases over the next six years, and will be financed by raising bonds, borrowings from local and foreign banks, and internally generated funds," Bisraya director Imran Salim told a media briefing in Petaling Jaya yesterday. It will be undertaken as a joint venture with Selangor economic and investment arm Perbadanan Kemajuan Negeri Selangor (PKNS). Bisraya, a subsidiary of Gapurna Group, received approval from PKNS in June last year for the development. The project is in the vicinity of Jalan Barat, Hilton Petaling Jaya hotel, A&W drive-in restaurant, light rail transit (LRT) station and Amcorp Mall adjacent to the Federal Highway. It will have four office towers, a residential tower and a hotel with green features. It will also be the site of PKNS' new headquarters. The proposed traffic dispersal is aimed at easing the bottlenecks at Jalan Barat and Jalan Templer, such as new alternate routes linking directly to existing high-ways like the New Pantai Expressway. The development will also be pedestrian-friendly with good connectivity to the nearby Asia Jaya and Taman Jaya LRT stations. Jones Lang Wootton (JLW) said in a statement that Malaysia remained a “transparent” market and the third most transparent country in South-East Asia after Singapore and Hong Kong, which were ranked 16th and 18th in the world respectively. “Malaysia’s stable economic and political history and forecast relatively strong gross domectic product growth will underpin the country’s attraction as a destination for real estate investors. Furthermore, Malaysia’s good levels of transparency will help the market gain momentum following the global financial crisis in 2008,” he said. The Asia-Pacific region showed general improvement in real estate market transparency, the statement said. Australia is the most transparent country in the world, followed by Canada (2nd), the United Kingdom (3rd) and New Zealand and Sweden (joint 4th). iProperty.com Malaysia, a property marketing site, has beaten its June 2009 record with a total of 1.1 million visitors for the month of June 2010. The 75 per cent growth is due to aggressive marketing efforts, online marketing and strategic partnership. iProperty.com.my says figures show it has 51 per cent new agent subscriptions and has over 4,300 real estate agents paying to advertise on the website.